I came across this jacket online a few weeks ago. 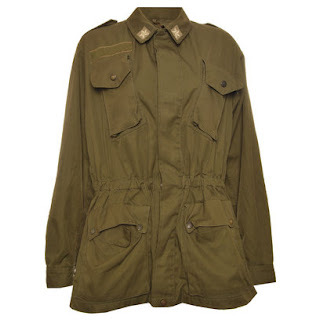 I've always wanted an Army jacket, but I have never found the time to actually go out and buy one for myself. This one is sold in Ark, but it is from Hearts & Bows, a brand which you can also find on Asos. It's only £30, which I think is a bargain for any kind of coat. I'm a fan of the elasticated waist, which will help give any women who wears it, a waist. I'm hopefully going to pick it up sometime over the upcoming weeks, so I'll keep you posted. What do you think of the jacket?